Beach Driving - What to do when you are stuck! - Welcome to NIHO Land & Cattle Company Ltd.
Beach Driving – What to do when you are stuck! NIHO Land & Cattle Company strongly advises that the best way to not get stuck on the beach….is not to drive there in the first place. Things have changed since Rudy and his family made their fateful trip around Haida Gwaii . While beach driving is allowed in parts of the United States, it is frowned upon, if not outright illegal throughout British Columbia. Beach driving is restricted on the beach in White Rock, and is not allowed in provincial parks. We talked to members of the 4 x 4 driving community, and they recommend the “Tread Lightly” code. It’s like the “Pack it in, Pack it out” philosophy of camping - if you must drive off-road, leave the landscape in the same or better condition as you found it. Responsible driving ensures that we will all be able to continue exploring the backcountry. However, if you do find yourself in a place where beach driving is permitted, such as Long Beach Peninsula in Washington, where beaches are considered part of the highway, take a couple of moments to scout out the terrain. David Blair, President of Rover-Landers of B.C, suggests that you always check out unknown sand before driving on it. Wet sand can hide dry spots, and dry sand is very fast. “There’s nothing like knowing what you’re getting yourself into before getting yourself out of it.” he commented. When driving on beaches, stay on wet sand, which is packed and allows your vehicle to maintain traction. 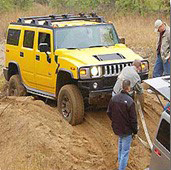 Dry sand turns into powder almost immediately, making it difficult to keep your vehicle from sinking. To prevent sinking, it's very important to keep your wheels from spinning. Keep 4 x 4s in the high drive and standards in second gear to prevent torque, which causes the wheels to spin. Also, maintain momentum - don’t stop your car for anything. You will get the worst wheel spin when you start the car up, and it will only take a couple of pumps of the gas to get you in trouble. So what do you do if you gunned the engine to get out and sunk? Well, before things get to this point, the best thing to do is to be sensitive to the car’s sinking. You want to stop before the car is axle-deep in sand. It's also smart never go 4 x 4ing alone - it’s much more fun with a buddy, and you may need some help at the end of the day to get yourself out of a tricky situation. The first thing to try is putting your car or truck in reverse and gently backing up along your tracks, as they provide a compacted path for your wheels. Another trick is rocking the car back and forth, remembering not to spin your wheels, so that the car compacts about 4-6 inches at a time. Each time you do this, it will compact the sand a little more, hopefully providing the stability you need to get out. You can also try deflating your tires down to a PSI of 13-20 and clearing some of the sand away from behind the tires and from the underside of the vehicle. If necessary, lower the psi to 10. Why deflate the tires? The softer the sand, the lower the pressure that is needed. Deflating your tires creates a bigger surface area, allowing the tires to float over the sand, rather than dig down into it. The more tire rubber you have on the sand, the more support your tires will have if one of them gets stuck. You must deflate all four tires, because the front two create sand hills that the rear two must climb continually. If you are still stuck and your tires are down to the minimum pressure, you will have to resort to a tow strap, winching, or jacking to extricate yourself. Using a tow strap is the easiest method, but it requires that your buddy be present. Make sure that you have secured tow points to the front and back of your vehicle, which is where you’ll be attaching the tow strap for your buddy to pull you out of the mess you’ve made. If you are by yourself you will have to resort to winching (if you have one!) or jacking. Before leaving home, take along a shovel, a bucket, and a pair of 2x10s. A shovel may be all you need, because you can use it to dig a rut in front of at least two, if not all four tires. You can also use a bucket to scoop up ocean water and pour it on the sand. This will harden the sand and give your tires a bit more friction. Wood planks also can be used to create added friction by putting them under a tire or two. Thank you to David Blair, President of Rover-Landers of British Columbia for his assistance with this article.